Roses are probably the most popular flower. Beautiful on their own or in bunches; this flower is one of the most multi-faceted evoking feelings ranging from passion to serenity and warmth to joy. Climbing roses – usually larger flowers which can grow up to 20 feet! Old garden roses – these can grow to huge heights and come in a wide variety of flower shape and size. Some can grow as high as 50ft. Not so very long ago the rose was regarded as a luxurious flower. Certain types were only available at certain times of the year; scented varieties were hard to come by. This naturally pushed up the price and arrangements using roses were the exception rather than the rule.However thanks to the worldwide export market dozens of varieties of roses, in every imaginable colour are available all year round. Naturally some are still very expensive because they take time and effort to grow, but in the main they are now easy to come by and we can all enjoy that little bit of luxury at an affordable cost. They are also a very hardy flower to use in arrangements and provided they are conditioned properly they can last quite a while. This all round arrangement is perfect to place on a table for a special celebration. It is equally at home in weddings, anniversaries or birthdays. And because it is easily portable makes a lovely gift to take away as a special reminder of what is probably a fabulous day!You do need quite a bit of plant material for this type of design. If you make it loosely and bulk out with foliage, then this will be ideal as generally it’s the flowers that cost the most. Plastic tray; floral foam; Flora bond; frog (these four items are available from a florists’ wholesaler; seven roses (hybrid variety is best); two bunches spray carnations; two bunches of alstromeria; leatherleaf; palm leaf; wax flower; eucalyptus; soft ruscus. Place a rose in the centre at the height you require then graduate the other roses through from one end to the other of the foam. 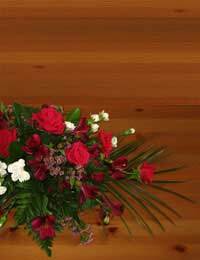 To finish off add a line of waxflower through the arrangement before filing in any gaps with eucalyptus and ruscus. At all times keep in mind the diamond shape.